I'm getting a little behind on my what I want to post about, so I figured I'd just do a general post about some things on my mind. For starters, I want to congratulate Roger on another fine win. Not only did Roger correctly identify yesterday's Person-of-Mystery, brining his total wins to five, but he also was the first to notice my little April Fool's Day prank. If you didn't notice, for my April 1 post, I photoshopped one of my great-grandmother's old post cards and added an Inverted Jenny postage stamp. This is one of the rarest and most valuable mistakes in postage history, so I thought it would be fun. Unfortunately, the stamp didn't come out until 1918, so I had to change the postmark as well to make it plausible. Roger was too sharp and noticed it right off. I enjoy April Fool's Day though, as it is also a way for me to play gentle jokes on my students. Fifteen minutes before the end of the period, "Okay class, pop quiz, please number your paper from 1 to 50... *groan* *moan* mutters the class APRIL FOOLS!" Oh what fun! I was clearly not as clever as yesterday's Person-of-Mystery (my Photoshop experience being the reason for my choice), the famous Dutch forger, Han van Meegeren. Van Meegeren was a painter who, had a reputation in the art community for wonderful execution, but who was also criticized for his lack of originality. 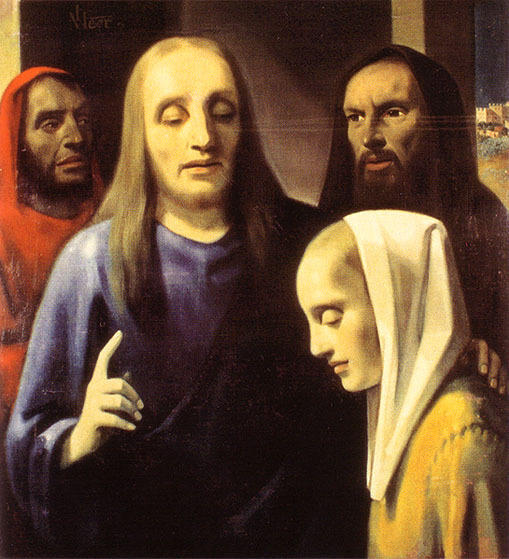 Van Meegeren disliked modern art and was rather put off by critical comments dismissive of his talent, so his plan was to perfect a system for replicating 17th century works, pass off a forgery as one of the great masters and then have his revenge by revealing it was a fake. About five years before World World War II, he pulled it off. 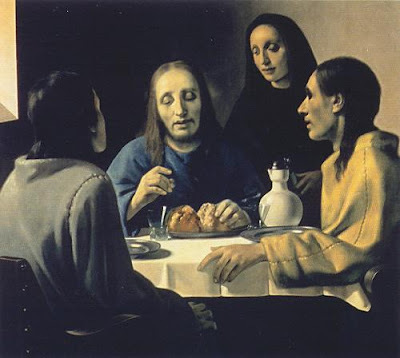 He created a new work that he called, The Supper at Emmaus, and passed it off as a Vermeer. It sold for about $6 million in today's money. Seeing how much could be made, van Meegeren's plans changed and he produced at least six additional fakes, earning him about $60 million in today's currency. One of these fake Vermeer's, Christ and the Adulteress, wound up in the private collection of Nazi Reichmarschall Hermann Göring. 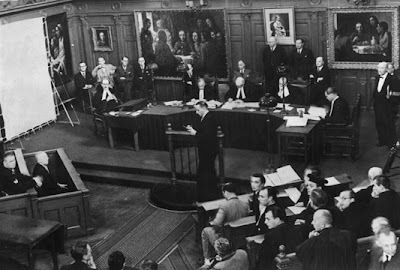 After the war, van Meegeren was charged with selling the "national treasure" of Holland, his fake Johannes Vermeer painting to the enemy, and therefore faced lengthy jail time (or worse). 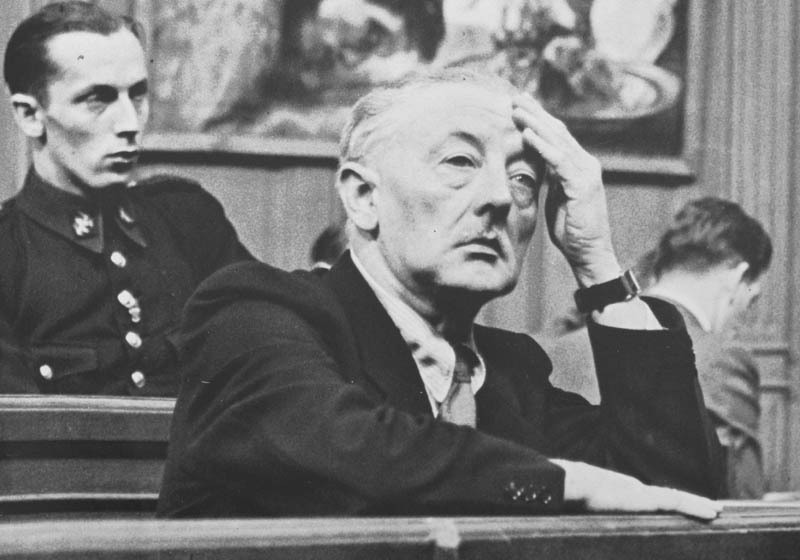 Van Meegeren's dilemma was that if he admitted that Göring's work was his own (thereby sparing his life), he would thereby reveal that his other paintings now accepted as the work of great artists were fraudulent. 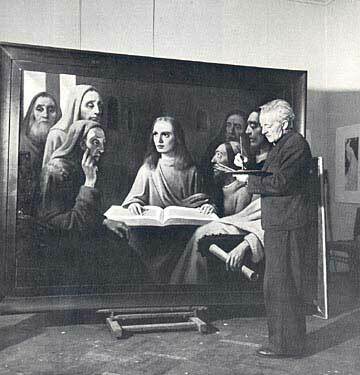 After several days in jail, van Meegeren declared that the work was his own, but he was disbelieved, so to prove himself guilty of the lesser crime of forgery, he painted a final fake in jail, the ironically named, Jesus Among the Doctors. Proving himself guilty, and having become a folk hero for swindling the Nazis, he received the minimum sentence of one year. It was revealed to Göring, right before his death, that his prized Vermeer was in fact a van Meegeren. Upon the revelation, a contemporary wrote of the Nazi leader that, "he looked as if for the first time he had discovered there was evil in the world." Mary is right in her comment, there are supposedly several good books on van Meegeren, but I admit I have yet to read any of these. If you have a favorite, I'd love your personal recommendation. Now on to a more personal note, here is a wrap-up of my wild weekend. On Friday night, I drove down to Santa Barbara to visit an old friend of mine who was staying at a hotel. 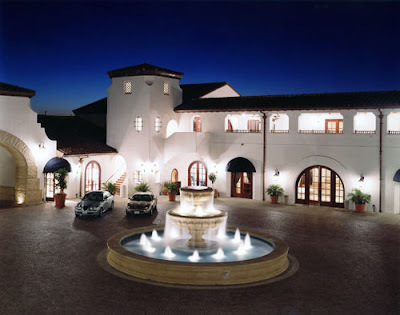 What he didn't tell me was that The Bacara is a luxury resort, so I felt a little awkward pulling my Toyota Corolla up in a crowd of limos and other fancy cars. After dinner, my buddy was taking care of his kids and was just wandering the hotel when some people spilled out of a banquet room. One of them came up to me and started engaging me in conversation, "What do you do?" and the like. I told him I was a school teacher and he was amused. He told me he was a screen writer and was currently working for Universal Studios. I think he must have initially thought I was there for their event. Before I could excuse myself, more of his friends came over and joined us and he revealed to them that I was a history teacher. Pretty soon they started talking about history subjects and the like and engaging me in more conversation. After a few minutes, the first guy called to this fellow walking by, "James, I want you to meet my new friend Nate." He looked familiar, so I said, "I'm sorry, you look familiar to me, do I know you?" He said, "I'm James Franco." I said, I'm sorry, I don't think I recognize that name. The small crowd around me started laughing and he revealed that he was an actor and started listing for me some of his movies. None of his movies I recognized as having seen (however, since that time, I googled him and he was in The Great Raid and Flyboys), two movies I did see, so I wasn't way off. I stayed in Santa Barbara until late and then drove home, because the next morning, one of my Boy Scouts was doing his Eagle Project, planting a number of trees on one of the hiking trails around our city. That went well, but I was pretty tired. Later on Saturday, my wife found out about a craft fair at a local hotel and we went to there. Our oldest boy and our youngest boy took part in pie eating contests. They both did well and both placed second. Then we came home and I assembled a dresser that had been delivered by UPS. I don't know if I've told you all, but I'm also mentoring one of my former students who is now enrolled in a National Guard Youth School, the Grizzly Academy. So after church, I took Daniel for an off base trip into town and we had lunch and saw the sights. I had to get home quick though because our youngest son Jonathan was having a bunch of friends over for a birthday party. Now, I'm off to work on finishing preparations for school tomorrow. It really does seem that I still need a weekend to recover from this one. Yes, Roger is on a winning spree! I didn’t notice the stamp, I was distracted by the name Alva. The Duke of Alva (Alba in English) burned down half of the Netherlands during our struggle for independence in the 16th century. I looked up the Barbara resort, looks nice! I didn’t know there was a large spaceport in the vicinity. And I looked at Bubblegum Alley, a real landmark! It even got its own wiki entry. I didn’t recognize the actor either, and the Grizzly Academy is a good initiative! I hope that you had at least washed your Toyota. You know, I love that this post not only contained some amazing history but also some sweet current events like the pie-eating contests! Love it! Did you watch the Oscars? I guess not. I watched a bit and saw James Franco presenting whatever. He was wearing a long red tafta gown and a very blond wig. The person presenting with him was a female dressed in a tuxedo. It was supposed to be some kind of a spoof. I learned all that much later. Don't know James Franco nor did I recognize Anne Hathaway.